I sponsor a Buddhist nun named Tenzin Pema who lives at the Jamyang Choling Institute in Dharamsala, India. 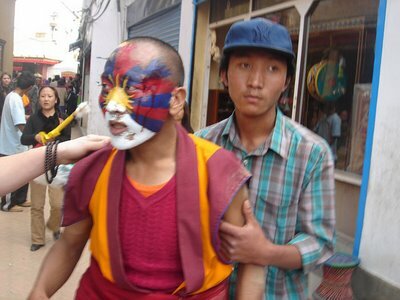 in the last two days I’ve received emails regarding the protests in Tibet. Her first email read: “…am sure you know what is happening in Tibet at the very difficult time. It is very worrying and saddened to see that many Tibetan already killed and many imprisoned. May peace and happiness become reality in Tibet and world very soon. Monks nuns and general public gathering at the Temple to do prayer and also doing peace march here in Dharamsala same as everywhere. As Tibetans make their most forceful demands for independence in years, their spiritual leader, the Dalai Lama, in exile in Dharamsala, India, outlines his concerns to the BBC’s Chris Morris. “Am I early?” asked the Dalai Lama, as he ambled into the room. He sat down and coughed, and thanked us for coming. “This is a critical time for us,” he said, as he waited for the interview to begin. He compared it to 1959, an iconic date for many Tibetans, when a huge uprising against Chinese rule was suppressed, and the Dalai Lama himself was forced to flee into exile on horseback. Eventually, he made his home here, in the foothills of the Indian Himalayas, in this small town which is known to some as Little Lhasa. It is awash with thousands of Tibetan activists-in-exile. As unrest in Tibet itself has escalated, there have been daily protests in Dharamsala throughout the week. Cars waving Tibetan flags weave through the pedestrian traffic, leaflets are pressed into passing hands, and a hunger strike is taking place outside the entrance to the Dalai Lama’s temple. And when the sun sinks below the mountain range, marchers – chanting Buddhist prayers for the souls of the dead – walk through the streets carrying candles. But beyond the slogans there is not much that most people here can do except watch and wait, as accurate information about what is happening in Tibet becomes harder to find. Many of the activists take a more radical line than the Dalai Lama himself. For years now he has campaigned for genuine autonomy in Tibet, not for independence. But a new generation seems increasingly impatient with nuanced diplomacy. Tibet’s spiritual leader is also appealing to the Chinese authorities. “Stability is important” is his message – but it must come from the heart, not simply from the use of physical force. There is not much sign, though, that Beijing is listening. “Of course I feel helpless,” the Dalai Lama admitted. He is particularly worried about the deadline given by China, for protestors to surrender by midnight on Sunday night or face the consequences. But the one thing Tibet’s spiritual leader does have – here and around the world – is moral authority. That is why President Bush met him in Washington recently, where the Dalai Lama was presented with the Congressional Gold Medal, America’s highest civilian honour. It infuriates China, but it is something that the authorities in Beijing cannot control. The photo below was taken today (Sunday) by my gal pal in Nepal, Caroline aka Sirensongs. Also see my post on my sister blog that contains two posts from Vanessa on boycotting the Olympics. Ironically this week the US saw fit to remove China from its list of human rights abusers. Are you going to stay silent? “Ironically this week the US saw fit to remove China from its list of human rights abusers.”WHAT? !May peace prevail. Thanks for sharing this information. I hope that the karma is ripening for some major change to occur. this whole situation has me flaming mad…China seems to think shutting the world out will make this go away. I can’t stand that they’ve got their boot-heel so firmly on the neck of Tibet.